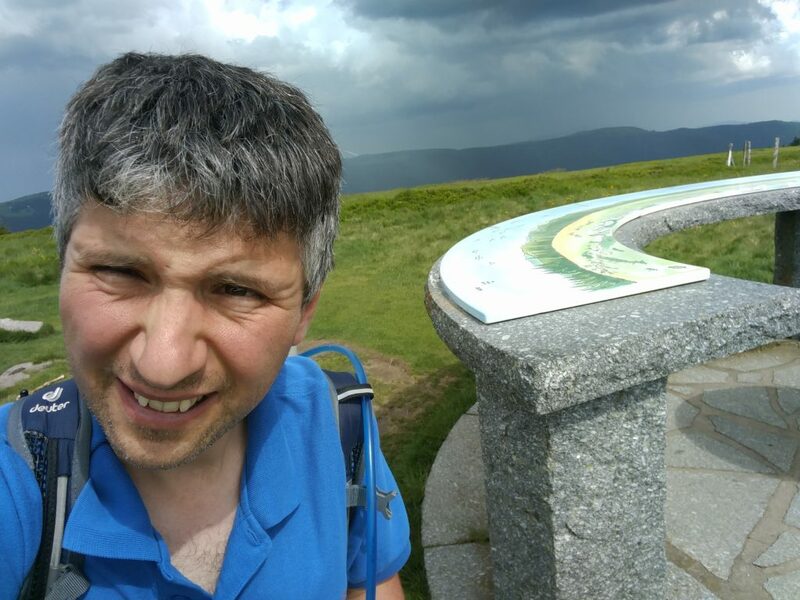 After a restful night, it was time to get up early for the second day of my attempt to get 100 SOTA points in a Bank Holiday weekend in the Vosges. Today would involve a bit more walking than yesterday. Le Hohneck, about 15 minutes’ drive from La Bresse, is potentially a very easy summit as it has a carpark and restaurant at the top. I fall into the set of SOTA activators who view that as cheating, however; much like taking the train up Snowdon. Instead, therefore, I took the only slightly more energetic option of a 15 minute walk up 100 metres over a 1km, on the path that runs beside the road. This is a really easy path and it’s well-trodden. The only thing to be aware of is that the electric fence wire surrounding one of the fields has been routed over the top of a turnstile gate (above head height) near the start of the path, which could be a surprise if you had a metal antenna on your backpack! 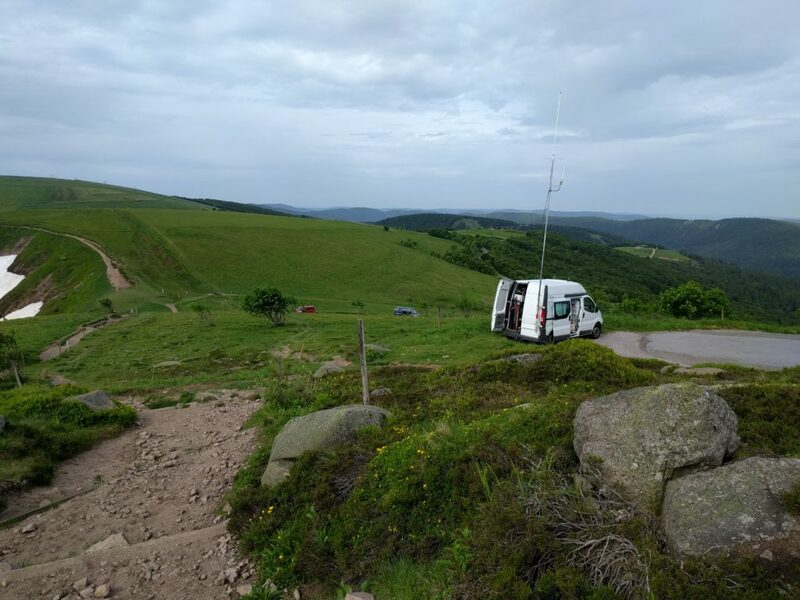 Halfway up, I spotted a van which seemed to be doing communications for a local race of some description, but I didn’t stop to find out the background. 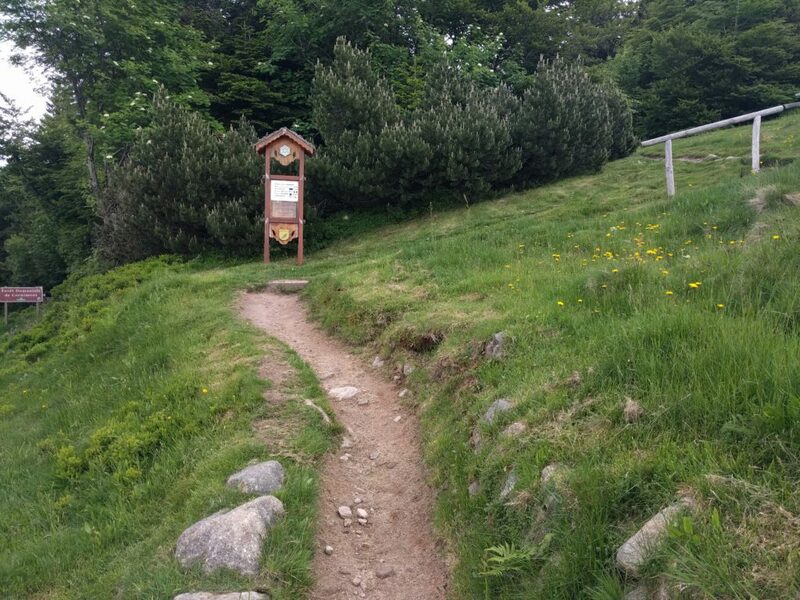 Half-way up Hohneck… It looks like a twin for the Camb-Hams’ Flossie is up here! Despite my early start, it was clear that Hohneck is a popular place. I didn’t feel my dipole was in the way at this stage of the morning, but any later and it might have been more problematic. I quickly made 9 QSOs and packed up to head to the next hill. 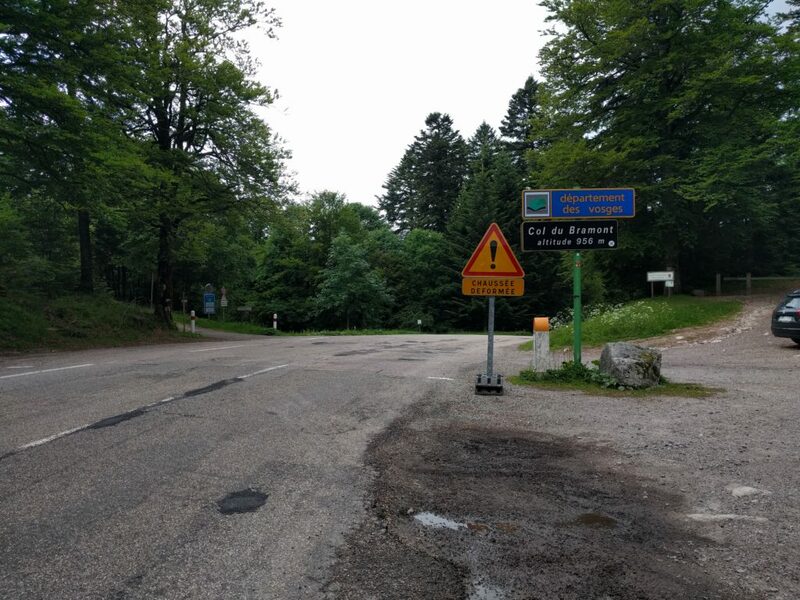 The Col de Bramont is about 15 minutes’ drive from Hohneck and it is a useful starting point for activations of Ronde Tête on one side of the road and L’Altenberg on the other. 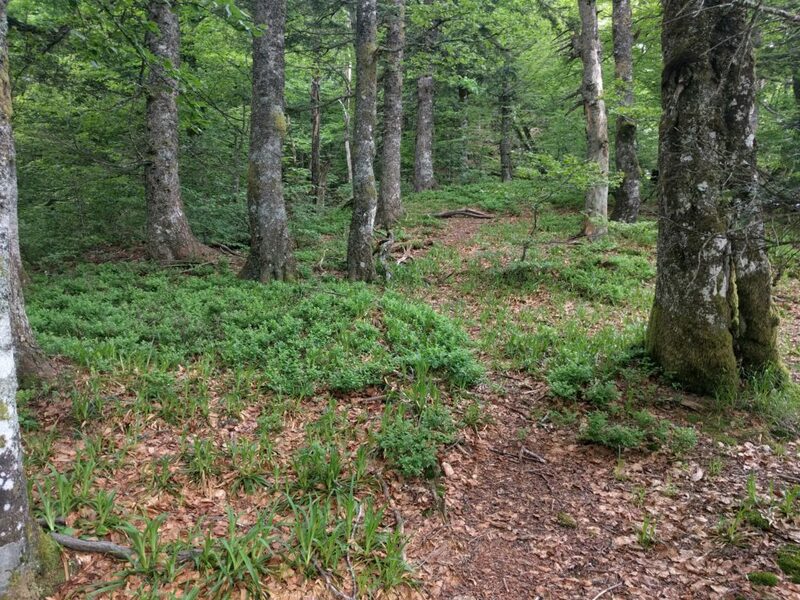 Both hills are similar, in that they are walks through forest on signed paths for the majority of the walk, before you have to leave the path to head through the trees into the activation zone. In both cases, I wouldn’t recommend doing the walks in ice or after heave rainfall, as the ground is mainly leaf-mulch which will become quite slippery. 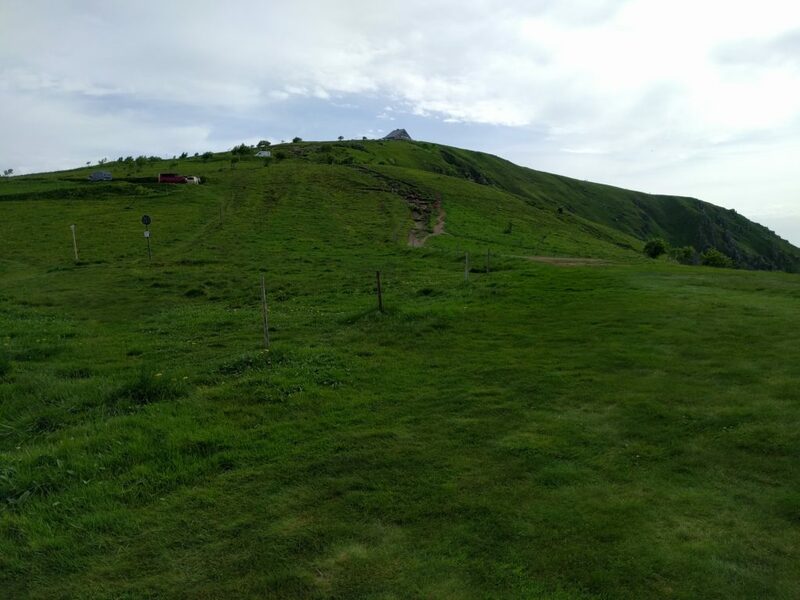 The walk up Ronde Tête is probably the marginally easier of the two walks. The path is mainly fairly wide and it’s clearly marked. The only thing to watch for is to ensure you take the route doubling back on yourself at 47.9995N, 6.9496E, rather that continuing in the same direction. 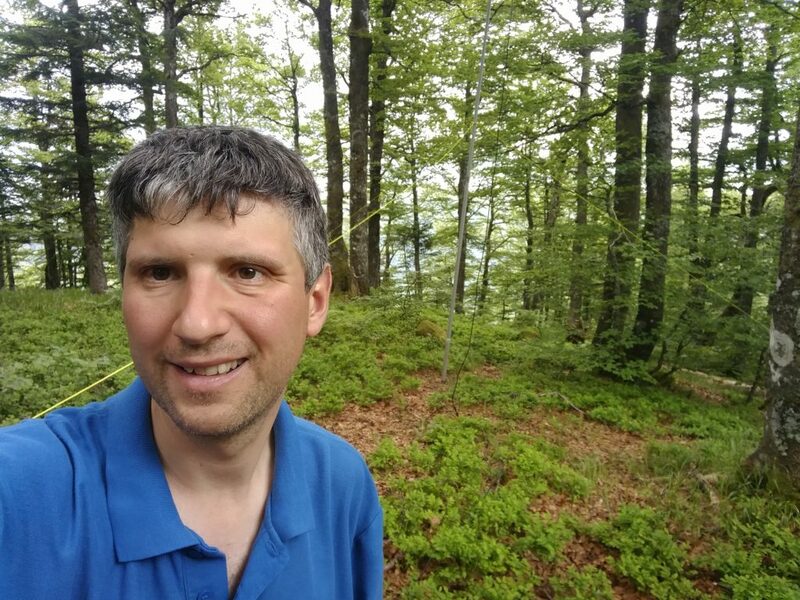 Having done that, it’s just a matter of following the path through the forest to the sign marked Panoramic view of Wildenstein, situated near 47.9979N, 6.9611E, where you leave the path and head up the slope. 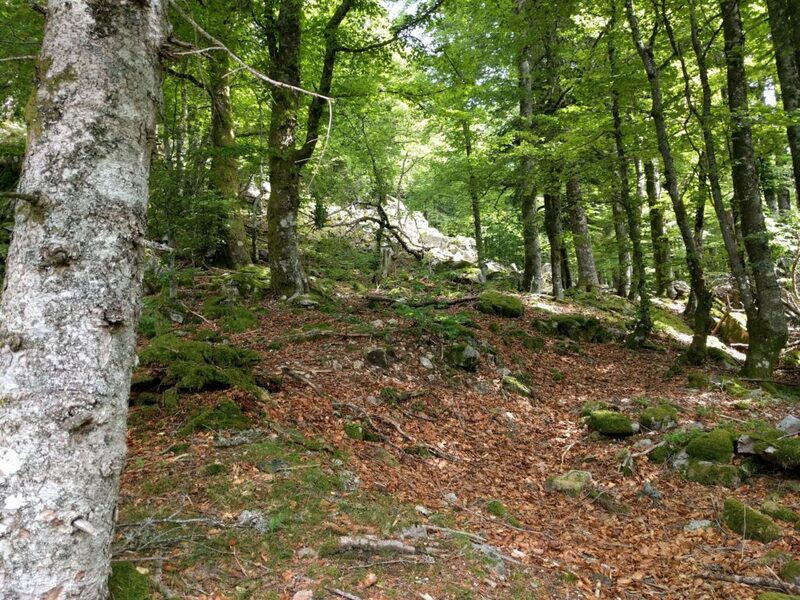 Again, you need to watch your footing a bit here, as the leaves are deep in places and stones are covered in moss, so it would be easy to slip in wetter conditions. The walk took me about 1 hour to climb the hill and about 30 minutes back down (as I spent some time picking my way up the slope on the ascent), with about a 190m ascent over about a 2km walk. Once at the top, I made 6 QSOs on 30m CW before descending. Returning to the road, in the opposite direction, is the similar climb up L’Altenberg. 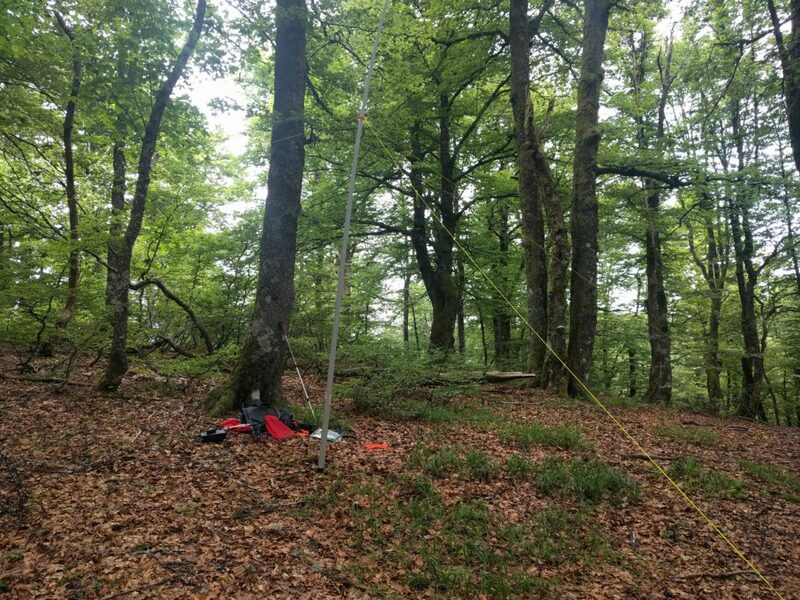 As with Ronde Tête, I’d certainly recommend taking a map and compass with you for this one, as my GPS struggled to maintain lock under the tree canopy. The relevant IGN 1:25,000 walking map is 3619OT. The climb up L’Altenberg is similar but slightly more challenging. The paths are narrower with steeper drops off the sides in places if you were to stumble. 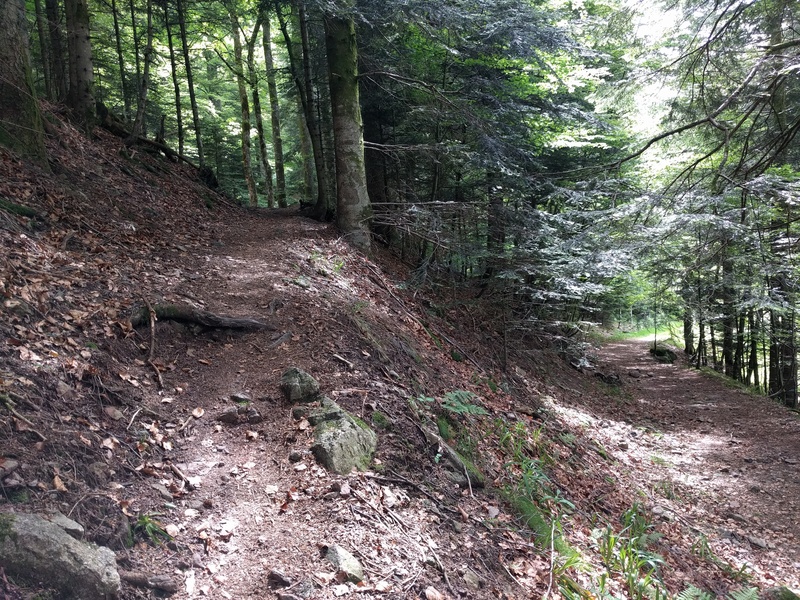 Walking alongside the Altenberg for a lot of the route, you wonder how you can climb some a steep slope, but keep heading south on the path to around 47.99105N, 6.94698E and there’s a less steep area, which is easier to ascend. The climb took about 45 minutes (and 30 minutes down) for about 145m ascent over about 2km of walk. Again, I just made 6 QSOs before heading back down the path. The last summit of the day, again a 10-pointer, was Le Grand Ventron. 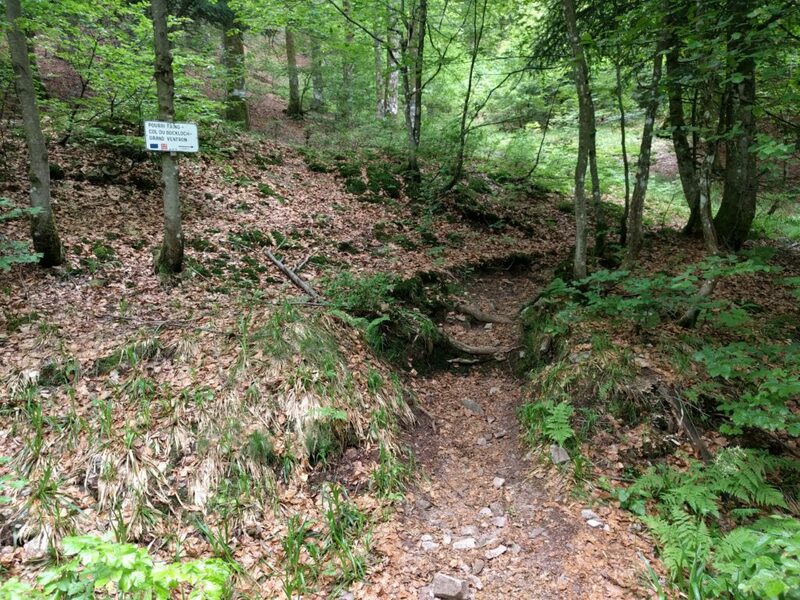 It can be accessed by continuing the path from L’Altenberg (though this is quite a substantial hike), or by taking the easier option of driving to the Auberge, from which it’s basically a quick step along a field edge to the summit. There really isn’t that much more to say about this walk. It’s literally 10 minutes’ walking, and not very steep, ascending just 150m over about 0.5km (most of which is done in the immediate climb up from the road). At the summit, there’s a chart showing all the nearby peaks and even on a muggy afternoon with a storm brewing, it was still quite popular. 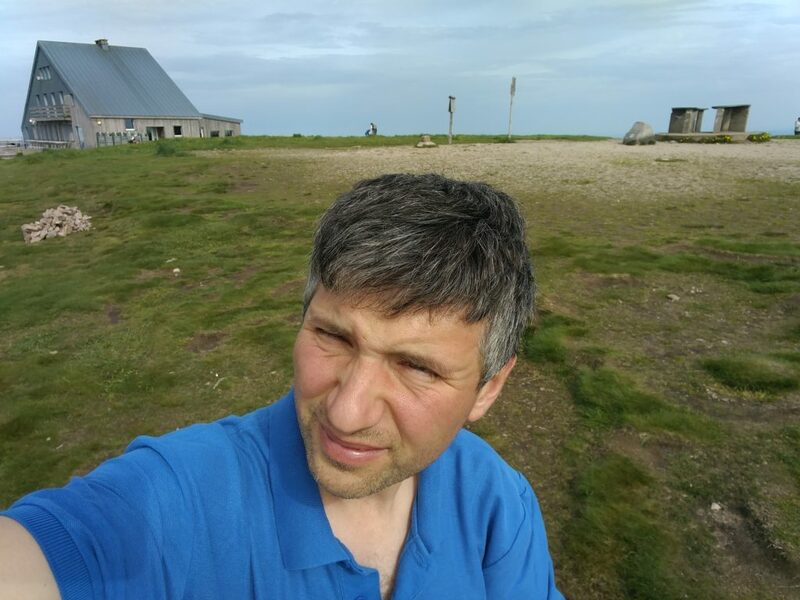 Luckily, the activation zone is quite large as the summit has a flat top, so I set up just a bit away from the highest point to make 8 QSOs, again on 30m CW. With 80 points so far this weekend, can I complete my 100 point challenge tomorrow?